NO PURCHASE NECESSARY TO ENTER OR WIN. A PURCHASE WILL NOT IMPROVE YOUR CHANCES OF WINNING. INTERNET ACCESS, A VALID SHOPPER’S CARD DIGITAL ACCOUNT & EMAIL ACCOUNT NECESSARY TO PARTICIPATE. 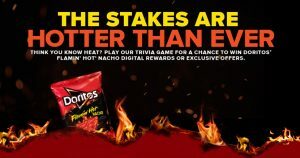 The “DORITOS® Flamin’ Hot” Sweepstakes (“Game” or “Promotion”) is offered only to legal residents of the fifty (50) United States (except FL, NY and RI) and the District of Columbia who are at least 18 years old at time of participation. Employees, officers and directors of Frito-Lay, Inc. (“Sponsor”), The Kroger Co., YOU Technology, LLC (“Administrator”) and their respective parent, affiliated and subsidiary companies (including each of The Kroger Co. Family of Stores listed in Rule 3), advertising and promotional agencies and any individuals/entities involved in the preparation of materials, execution and/or administration of this Promotion (collectively the “Promotion Entities”) are not eligible to participate. Groups, clubs, organizations, commercial entities and businesses are not eligible to participate. The Promotion is void in FL, NY and RI and where prohibited or restricted by law. Participants must have a participating digital account tied to a participating Shopper’s Card which may be obtained without cost. See Rule 3 for details. The Promotion begins on or about 12:00 am Pacific Time (PT) on April 12, 2019 and ends on or about 11:59 pm (PT) on May 7, 2019 (the “Promotion Period”). The Promotion consists of a trivia game, as described herein (the “Game”). Participants may participate in the Game during the Promotion Period once per day. A “day” is defined as the period 12:00 am PT until 11:59 pm PT each calendar date during the Promotion Period. All time referenced herein is Pacific Time. Administrator’s server’s clock is the official time keeping device for the Promotion. PARTICIPANTS ARE SOLELY RESPONSIBLE FOR DETERMINING THE CORRESPONDING TIME ZONE IN THEIR RESPECTIVE JURISDICTIONS; SPONSOR AND ADMINISTRATOR DISCLAIM ALL LIABILITY AND RESPONSIBILITY RELATING THERETO. During the Promotion Period, access Kroger.com/doritos (“Website”) and sign in to your digital account tied to your participating Shopper’s Card (“account”). If you do not have an account, follow the instructions to register online or sign up in-store and then create an online account at your participating Kroger Co. Family of Stores retailer website. Creating an account is free. After signing in you will be taken to a landing page with instructions on how to play the Trivia Game for a chance to win a prize. The Trivia Game consists of four (4) separate trivia questions and, once all four are completed, will constitute a Game play (“Game Play”). Each Game Play will be considered one “entry.” Although a response must be provided for each of the four questions (or, if time runs out, the correct response will be shown), responses do not need to be correct. Prizes are seeded by time of day, which determines whether or not a winning or non-winning message is displayed on the screen after a Game Play. If your Game Play is the first to occur at or after one of the randomly-generated winning times, you will be a potential instant winner of an instant win prize indicated in the Prize section below (“Instant Win” prize). If multiple Game Plays are received at exactly the same winning time, the Website will randomly select which of the Game Plays is the winning Game Play for that winning time. 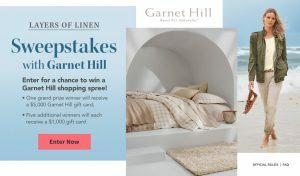 If you are an Instant Win prize winner, you will instantly see an on-screen message indicating that you have won (subject to verification) an Instant Win prize. If you are not a winner, the on-screen message will indicate that you may be eligible for a free exclusive DORITOS® Flamin’ Hot Nacho mobile or desktop wallpaper (“Wallpaper”) to download. If you are an Instant Win prize winner, follow the instructions to add the prize to your account. Limit one Game Play/entry per person/household/Shopper’s Card account per day (as defined above) across all banners. Except where prohibited, acceptance of any prize constitutes winner’s consent to Sponsor’s (and its authorized representatives) use of winner’s name, likeness, photograph, voice, opinions, and/or hometown and state for promotional purposes in any media now known or hereinafter developed, worldwide, without prior approval, review, further payment or consideration. Sponsor, Kroger, Administrator and all other Promotion Entities are not responsible for any incorrect or inaccurate information, whether caused by Website users, human error, tampering, hacking or by any of the equipment, software or programming associated with or utilized in the Promotion, or any element thereof, and assume no responsibility for any error, omission, interruption, deletion, defect, delay in operation or transmission, communications failure, theft, loss or destruction of Game Plays/entries, nor for the failure to collect, track or acknowledge Game Plays/entries. Further, Sponsor, Kroger, Administrator and all other Promotion Entities are not responsible for injury or damage to participants’ or to any other person’s computer/device related to or resulting from downloading materials from or use of the Website. If, for any reason, the Promotion or any element thereof (in whole or in part) in the sole opinion of Sponsor, Kroger or Administrator, is not capable of running as planned by reason of, but not limited to, infection by computer virus, worms, bugs, tampering, unauthorized intervention, human or technological error, force majeure, fraud, cheating, technical failures, or any other causes similar or dissimilar which Sponsor, in its absolute opinion deems could corrupt or affect the administration, security, fairness, integrity or proper conduct of this Promotion or any element thereof (in whole or in part), Sponsor reserves the right at its sole discretion to cancel, terminate, modify or suspend the Promotion or Game Play or any element thereof, and to randomly award any remaining prizes from among all non-suspect, eligible participants as of the date/time such action os taken in a manner deemed by Sponsor in its absolute discretion to be fair. Notice of such action by Sponsor will be posted on the Website. Sponsor, Kroger, Administrator and all other Promotion Entities are not responsible for any typographical, human, technological or other errors in the printing of promotional materials, administration of the Promotion or any element thereof, or in the announcement or notifications of prizes/prize winners. In the event there is a discrepancy or inconsistency between disclosures or other statements contained in any Promotion-related materials, communications or notifications and the terms and conditions of these Official Rules, these Official Rules shall prevail, govern and control. Federal, State and local taxes applicable to any prize, if any, are the responsibility of the winners. Failure to timely return or properly complete release documents (if required for prize claim), or if a potential winner is non-compliant or found to be ineligible, at any time, it will result in prize forfeiture. All forfeited prizes will revert to Sponsor’s ownership. Except where prohibited, participants agree that: (a) any and all disputes, claims, and causes of action arising out of or connected with this Promotion shall be resolved individually, without resort to any form of class action, and exclusively by an action in state or federal court located in the appropriate courts in Hamilton County, Ohio and expressly agree and consent to the subject matter and personal jurisdiction of such courts; (b) any and all claims, judgments and awards shall be limited to actual out-of-pocket costs incurred, including costs associated with participating in this Promotion but in no event attorneys’ fees; and (c) to the extent allowed by applicable law, under no circumstances will participant be permitted to obtain awards for, and participant hereby waives all rights to claim, punitive, incidental and consequential damages and any other damages, other than for actual out-of-pocket expenses, and hereby waives any and all rights to have damages multiplied or otherwise increased. All issues and questions concerning the construction, validity, interpretation and enforceability of these Official Rules or the rights and obligations of participant, Sponsor, Kroger and/or Administrator in connection with this Promotion, shall be governed by, and construed in accordance with, the laws of the state of Ohio without regard to conflicts of law principles (whether of Ohio or any other jurisdiction), that would cause the application of the laws of any jurisdiction other than Ohio.